A rotor ship is a type of ship designed to use the Magnus effect for propulsion. The ship is propelled, at least in part, by large vertical rotors, sometimes known as rotor sails. 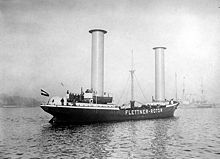 German engineer Anton Flettner was the first to build a ship which attempted to tap this force for propulsion, and ships using his type of rotor are sometimes known as Flettner ships. The Magnus effect is a force acting on a spinning body in a moving airstream, which produces a force perpendicular to both the direction of the airstream and the axis of the rotor. 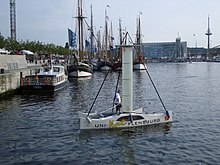 A rotor or Flettner ship is designed to use the Magnus effect for propulsion. The Magnus effect is a force acting on a spinning body in a moving airstream, which acts perpendicular to both the direction of the airstream and of the rotor axis. A Magnus rotor used to propel a ship is called a rotor sail and is mounted with its axis vertical. When the wind blows from the side, the Magnus effect creates a forward thrust. Thus, as with any sailing ship, a rotor ship can only move forwards when there is a wind blowing. The most common form of rotor sail is the Flettner rotor. However if the ship changes tack so that the wind comes from the other side, then the direction of rotation must be reversed or the ship would be driven backwards. The wind does not power the rotor itself, which must have its own power source. Like other sailing ships, rotor ships often have a small conventional propeller as well, to provide ease of manoeuvrability and forward propulsion at slow speeds and when the wind is not blowing or the rotor is stopped. In a hybrid rotor ship the propeller is the primary source of propulsion, while the rotor serves to offload it and thus increase overall fuel economy. The German engineer Anton Flettner was the first to build a ship which attempted to use the Magnus effect for propulsion. Assisted by Albert Betz, Jakob Ackeret, and Ludwig Prandtl, Flettner constructed an experimental rotor vessel; October 1924 the Germaniawerft finished construction of a large two-rotor ship named Buckau. The vessel was a refitted schooner which carried two cylinders (or rotors) approximately 15 metres (50 ft) high, and 3 metres (10 ft) in diameter, driven by an electric propulsion system of 50 hp (37 kW) power. The Buckau sailed from Danzig to Scotland across the North Sea in February 1925. The ship could tack (sail into the wind) at 20–30 degrees, hence the rotors did not give cause for concern in stormy weather. The ship was renamed Baden Baden after the German spa town and on 31 March 1926 was sailed to New York via South America, arriving in New York Harbor on 9 May. The ship had proved inefficient on these voyages, with the power consumed by spinning 15m tall drums being greatly disproportionate to the propulsive effect when compared with conventional propellers. As the system could not compete economically, Flettner turned his attention to other projects and the rotors were removed. In 1926, a larger ship with three rotors, the Barbara was built by the shipyard A.G. Weser in Bremen. Interest in rotor sails revived in the 1980s, as a way of increasing the fuel efficiency of a conventionally powered ship. Enercon launched the hybrid rotor ship E-Ship 1 on 2 August 2008. From 2010 it has been used to transport the company's turbine products and other equipment. Enercon claim "operational fuel savings of up to 25% compared to same-sized conventional freight vessels." In 2007, Stephen H. Salter and John Latham proposed the building of 1,500 robotic rotor ships to mitigate global warming. The ships would spray seawater into the air to enhance cloud reflectivity. A prototype rotor ship was tested on Discovery Project Earth. The rotors were made of carbon fibre and were attached to a retrofitted trimaran and propelled the vessel stably through the water at a speed of six knots. In 2009 Wärtsilä proposed a cruiseferry that would utilise Flettner rotors as a means of reducing fuel consumption. The Finnish ferry operator Viking Line adopted the idea, with MS Viking Grace built in 2011–2012, initially without rotors. A rotor system was retrofitted in 2018. In 2014 and 2015 Norsepower installed twin rotor sails on Finnish shipping company Bore's RoRo vessel M/V Estraden. In May 2018 the 1996 built cargo ship Fehn Pollux of the German based Fehn Shipmanagement (Leer) was fitted with an 18m long Flettner rotor of the EcoFlettner type at the front. In 2018 Norsepower started testing the rotor concept with the world's biggest shipping company, Maersk. The Maersk Pelican, an LR2 class tanker, has been fitted with two Norsepower Rotor Sails in readiness for trials. The MV Afros (IMO 9746803) bulk carrier has operated 4 movable rotors over a year with good results. ^ Hubert Chanson (30 August 2013). Applied Hydrodynamics: An Introduction. CRC Press. pp. 100–. ISBN 978-1-315-86304-7. ^ a b c d Gilmore, C.P. (1984). "Spin Sail: Harnesses Mysterious Magnus Effect for Ship Propulsion," Popular Science (January), pp. 70-73, see , accessed 13 October 2015. ^ Anon. ; "America's First Rotor Boat", Popular Science Monthly, September 1925, page 27. ^ G. A. Tokaty (20 February 2013). A History and Philosophy of Fluid Mechanics. Courier Corporation. pp. 150–. ISBN 978-0-486-15265-3. ^ a b Seufert, Wolf & Seufert, Ulrich; "Critics in a spin over Flettner's Ships", New Scientist, 10 March 1983, pp. 656-659. ^ G. A. Tokaty (1994). A History and Philosophy of Fluid Mechanics. Courier Corporation. pp. 152–. ISBN 978-0-486-68103-0. ^ United States Naval Institute (1970). Proceedings. ^ Ray, Keith. The Strangest Aircraft of All TIme. Stroud, Gloucester GL5 2QG: The History Press. p. 48. ISBN 9780750960977. ^ Fred M Walker (5 May 2010). Ships and Shipbuilders: Pioneers of Design and Construction. Seaforth Publishing. pp. 220–. ISBN 978-1-84832-072-7. ^ Bahman Zohuri (3 September 2016). Nuclear Energy for Hydrogen Generation through Intermediate Heat Exchangers: A Renewable Source of Energy. Springer. pp. 23–. ISBN 978-3-319-29838-2. ^ Kennedy, John (2010). "Discovery: State-of-the-art cargo ship to dock with haul of wind turbines". Silicon Republic (online, August, 10). Retrieved 12 October 2015. ^ Anon. (2012). "PM E-Ship1 Ergebnisse DBU" (PDF). Enercon.de. Archived from the original (PDF) on June 7, 2014. Retrieved 2015-10-12. ^ Anon. (2015). "Flettner rotor". Thiiink Holding. Retrieved 12 October 2015. ^ Latham, John (2007). "Futuristic fleet of 'cloudseeders' (15 February)". BBC. Archived from the original on 2012-07-25. Retrieved 2012-07-25. ^ Salter, Stephen; Sortino, Graham; Latham, John (2008). "Sea-going hardware for the cloud albedo method of reversing global warming". Phil. Trans. R. Soc. A. 366 (1882, 13 November): 3989–4006. Bibcode:2008RSPTA.366.3989S. doi:10.1098/rsta.2008.0136. PMID 18757273. Retrieved 2009-07-27. ^ Reinikainen, Kari (2009). "Wind and lng [liquified natural gas] power Wartsila's cruise ferry design". Cruise Business Online (22 June). Archived from the original on 2011-07-08. Retrieved 2010-01-19. ^ Bryce, Emma (29 May 2018). "Cheap oil killed sailing ships. Now they're back and totally tubular". Wired UK. Retrieved 29 May 2018. ^ "Norsepower". www.norsepower.com. Retrieved 2016-11-25. ^ "Rotor Sails Fitted on board Maersk's Tanker in a World's 1st". Aug 30, 2018. ^ Shipping, Green (13 March 2019). "Blue Planet Shipping receives GREEN4SEA Dry Bulk Operator Award". SAFETY4SEA. Retrieved 6 April 2019. ^ "Video: ANEMOI Flettner Rotor System - MV Afros Sailing". 4 June 2018. ^ "Video: ANEMOI moving Flettner Rotor System - MV Afros Berthing". 26 November 2018. Wikimedia Commons has media related to Rotor ships.